Whitley Bay High School students celebrating their A Level results. Whitley Bay High School has made it into a list of the best state secondary schools in the North East. It takes eighth place in the ranking in Parent Power, The Sunday Times Schools Guide 2019. The top 10 state secondary schools in the North East are: Durham Johnston Comprehensive School; Queen Elizabeth High School, Hexham; St Cuthbert’s RC High School, Newcastle; Emmanuel College, Gateshead; Egglescliffe School, Stockton-on-Tees; King Edward VI School, Morpeth; Sacred Heart RC High School, Newcastle; Whitley Bay High School; Carmel College, Darlington; St Leonard’s RC School, Durham. The top independent secondary schools in the North East are: Royal Grammar School, Newcastle; Yarm School; Durham High School for Girls; Durham School; Newcastle High School for Girls GDST; Teesside High School, Eaglescliffe; Westfield School, Newcastle; Longridge Towers School, Berwick. Parent Power is widely acknowledged as the most authoritative survey of the country’s best schools. The rankings in the secondary school league tables are determined by the percentage of examination entries gaining A* to B grades at A-level this summer (which is given double weighting) and the percentage of entries returning A* and A grades, and those graded 9, 8 and 7, at GCSE. They are published several weeks ahead of the official Government tables for secondary school performance. St Cuthbert’s RC High School, in Newcastle, has won The Sunday Times Northeast State Secondary School of the Year award in recognition of its outstanding academic results this year. More than two-thirds of all A-level outcomes secured the top A*, A or B grades, while 32.2% of GCSEs gained A*/A/9/8/7 grades. The school enters Parent Power’s northeast state school rankings in third place this year. Alastair McCall, editor of Parent Power, said: “St Cuthbert’s serves its community in the west end of Newcastle with great distinction. Its location in one of the most socially and economically challenged districts in the northeast is not used as an excuse to fail, but rather to inspire the boys lucky enough to come here to achieve their dreams. Durham Johnston is once again the top performing state secondary school in the Northeast of England. The school, has seen improvement in its GCSE results this year with 39.3% of exams achieving A*/A/9/8/7 grades compared to 32.4% in 2017. Meanwhile at A-level, nearly three-quarters of all examinations returned A*, A or B grades. The school ranks 137th in the national table, up by three places this year, and just outside the top 10 nationally for schools with a fully non-selective intake at Year 7. St Bede’s RC Primary School in Marske-by-the-Sea, has also been named The Sunday Times State Primary School of the Year. The mid-sized primary school has achieved great results ranking joint fourth in the primary school league table for England this year, up from 24th last year. The average scaled scores for reading, grammar and maths are all running at well above 110pts, the level at which children are deemed to be working at a “higher” level. 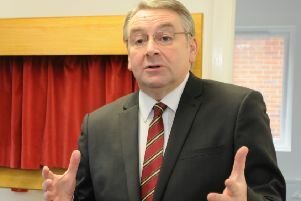 Alastair said: “St Bede’s in Marske-by-the-Sea is the embodiment of what an outstanding primary school should be. Its children achieve excellent results, but the school offers so much more than that. Committed and talented staff tease the best out of the children in a school where moral and spiritual development counts as much as academic achievement. Yarm School has been named The Sunday Times Northeast Independent Secondary School of the Year. More than 76% of exams at A-level achieved grades A*-B this year, up 8.6 percentage points on last year. The school also saw GCSE results of 66.2% receiving A*/A/9/8/7 grades. As a result the school has jumped 35 places up the national league table in the last year. Alastair said: “Founded just 40 years ago, Yarm School has made a huge impact in a short space of time and has established itself as a powerhouse of independent education in the northeast. The Royal Grammar School, Newcastle, once again tops the regional independent rankings and jumped nine places in this year’s national league table due in part to improved results at GCSE and continued strong performance at A-level and Pre-U in the sixth form, where more than 87% of grades this summer returned A*, A or B grades or equivalent.